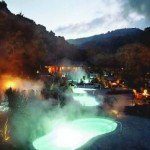 The San Francisco Chronicle recently visited The Refuge Spa at Carmel Valley Athletic Club. Axel Binneboese, General Manager, has a very clear and experienced understanding of many of the elements the authentic sauna experience. We applaud his efforts as we preach the rubber band theory and have spoken at length about the escape elements and reset button. Binneboese helped owner Scot McKay refine his concept of a relaxation spa during the athletic club’s recent rebuilding. Patrons are encouraged to raise their temperature in the large wood sauna or smaller eucalyptus steam room, then to cool down quickly in one of four rock-lined cold pools (marked “cool” and “cold,” which might feel more like “bracing” and “arctic”), and last to recline outdoors around one of many fire pits, or indoors on lounges designed to hug the body and ease the pull of gravity.